For 2012, qualifying times for all groups are lower by 1 minute. For 2013, qualifying times for all groups drop another 5 minutes. For both years, runners who beat their qualifying time by 20 minutes are allowed to register first, followed by runners who qualify by 10 minutes, 5 minutes, and then 0 minutes. Among runners, there has been a lot of discussion of the effect these changes will have on the demographics of the race, especially the proportion of women and older runners. To answer this question, we have to get a sense of what the pool of potential qualifiers looks like. I collected data from the 2008, 2009 and 2010 Chicago Marathons (don’t ask me how). This dataset includes 101135 finish times with the gender and age of each runner. To keep things simple, I treat each finish time as a different runner, even though many people ran the race in more than one of the years I looked at. I selected runners in the 18-34 group, which includes 22619 men and 24471 women. Then I selected the runners who ran 30 minutes over the current qualifying standard or faster, which includes 4951 men and 5502 women. The BQ Effect, which I wrote about last week, is apparent for men and women. For the men there is another mode 10 minutes below the standard, which happens to be 3:00:00. Apparently the only thing more important than qualifying for Boston is breaking 3 hours. The runners in this dataset are a sample of the population that constitutes the field at Boston. If we assume that this sample is representative, we can use it to predict the effect of the changes in the qualifying standard. As a baseline, in 2010 there were 9602 finishers in the open division, 4651 men and 4951 women. In the Chicago sample, tightening the standard by 1 minute (which will happen in 2012) disqualifies 92 men (4.9%) and 102 women (5.6%). Extrapolating these changes to the open division in Boston (9602), the net effect is to replace 16 women with men. In 2013, the standard will be 6 minutes lower, which disqualifies 30.1% of men and 33.9% of women, and displaces 134 women. The new registration process might make the effect even more dramatic. 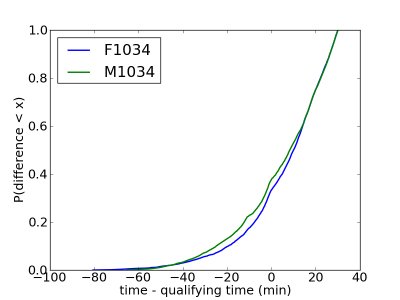 If the field fills before the last group has a chance, the standard is effectively tougher by 11 minutes. That disqualifies 41.6% of men, 50.5% of women, and displaces 395 women. This change would be noticeable. In 2010, the open division was almost 52% female. In 2013, it might be 52% male. Is that fair? I will argue that it is not, but it will take some time to make the argument clear. Let me start by explaining why some people think it’s fair. It is conventional wisdom that the current standard is relatively easy for women. If that’s true, then these changes will be a correction. For example, in this article Amby Burfoot proposes a standard based on the age-graded tables created by World Masters Athletics (WMA). Under that standard, the qualifying times would be 3:12 for men and 3:30 for women. In the Chicago sample, that would increase the number of men by 8% and decrease the number of women by 47%. Extrapolating to Boston, it would replace 1751 women with men, yielding a field of 66% men. I think this standard is unreasonable because the WMA tables are based on world records in each group, not the performance of more typical qualifiers. The proposed standard has a bigger effect on women because the elite females are farther from the pack than the elite males. The tail for women extends farther to the left. The fastest men beat the standard by 65 minutes; the fastest women beat it by more than 80 minutes. But the existence of a small number of outliers should not have such a drastic effect on the qualifying standard. 1) The changes in the qualifying standard and process might decrease the representation of women in Boston from 52% to 48%. 2) The common belief that the standard is relatively easy for women is based on the performance of a small number of outliers. The gender gap for near-qualifiers is much larger than the gap for elites. 3) Implementing the standard proposed by Runners’ World would decrease the percentage of women in the open division at Boston to 33%. 1) I will evaluate possible definitions of a “fair” standard and compute qualifying times for each definition. 2) I will extend this analysis to the other age groups. In order to register for the Boston Marathon, you have to run another marathon faster than the qualifying standard for your age group and gender. For example, men 34 and under have to run 3:10 or better. Since I am 43, my qualifying time is 3:20 -- on my 45th birthday I get another ten minutes (wrapped up with a bow). These standards are challenging. At most major marathons, less than 20% of the field runs a Boston qualifying time, known as a “BQ.” According to marathonguide.com, the races in 2010 with the highest percentage of qualifiers were the Bay State Marathon (37%) and Boston itself (44%). Two years ago I ran the Bay State Marathon in my first (unsuccessful) attempt to qualify. I was almost on pace for the first 20 miles, then hit the wall and slowed from 7:50 per mile to 10:00. While I shuffling through the last few miles, I wondered whether the Boston qualifying times have a visible effect on the distribution of finish times. 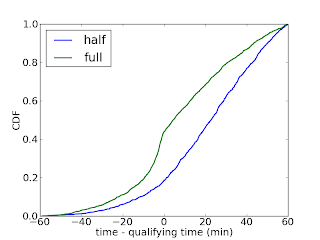 I can imagine several possible BQ effects: (1) an excess of runners finishing just under the qualifying time, (2) a deficit of runners just over, and maybe (3) an excess of runners like me who attempt a qualifying time, bonk, and end up 10-20 minutes over. To look for these effects, I collected data from the 2010 Bay State Marathon (available at coolrunning.com). 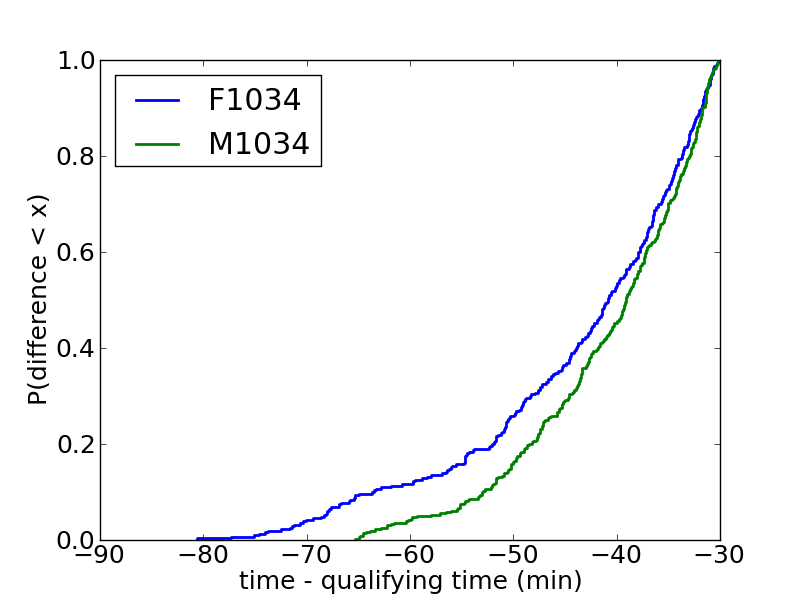 For each of the 1564 finishers, I looked up their age and gender to get qualifying times, and computed the difference in minutes between their actual and qualifying times. For comparison, I also collected data from the 2010 Sun Lowell Half Marathon, which runs on (mostly) the same course at the same time. 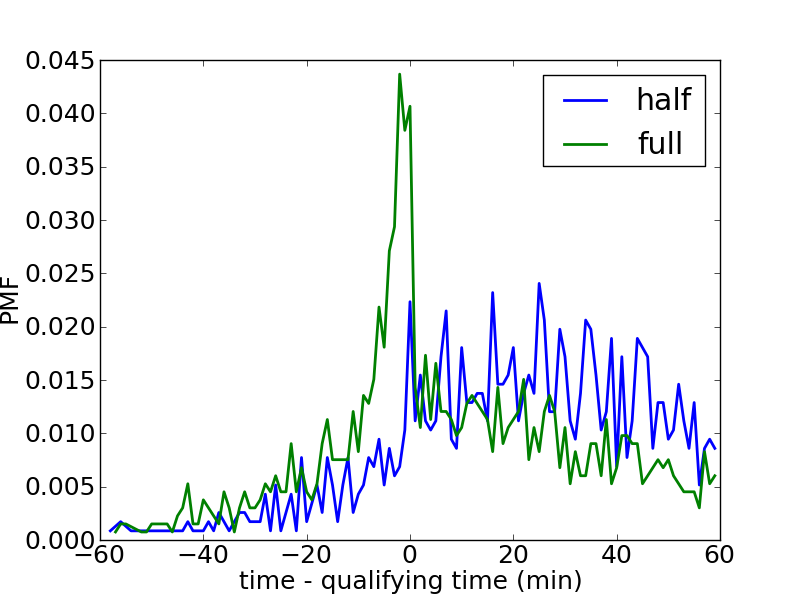 For each half-marathoner, I computed a marathon time prediction using the well-known Riegel formula. 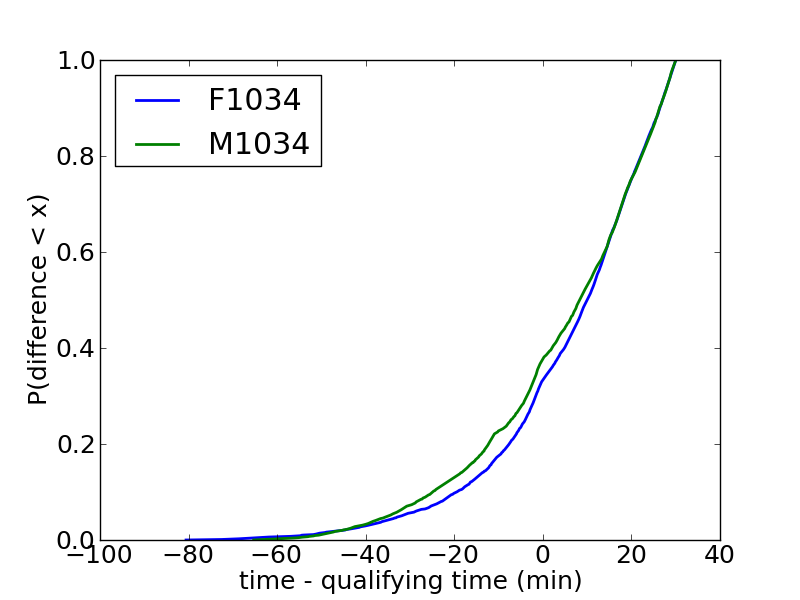 The following figure shows the PMF of finish time, relative to qualifying time, for runners in both races whose finish time (real or imagined) was within 60 minutes of their qualifying time. A negative difference means the runner qualified. 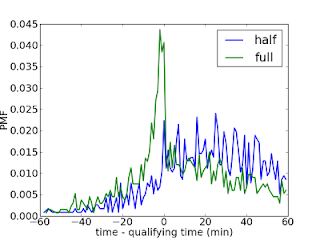 As expected, there is a substantial mode just under the qualifying time for the marathoners, but not for the half marathoners. The other two hypothetical effects are not apparent. 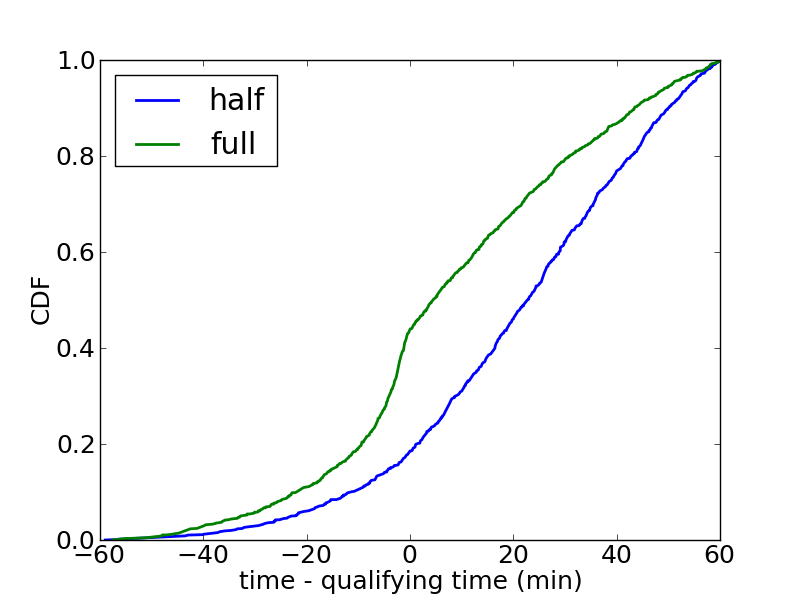 Again, the BQ effect is clear: in the full marathon there are more runners just under the qualifying time and fewer just over. But either the number of people who bonk is small, or their times are sufficiently spread out that they don’t constitute an apparent mode. I am a mode of one. Are first babies more likely to be late? UPDATE 25 Sep 2015: I wrote a followup to this article that uses more data and presents better visualizations of the results. The updated results are similar: among full term pregnancies, first babies are more likely to be late, by about 2 days on average. When my wife and I were expecting our first child, we heard from several people that first babies tend to be late. If you Google this question, you will find plenty of discussion. Some people claim it's true, others say it's a myth, and some people say it's the other way around: first babies come early. 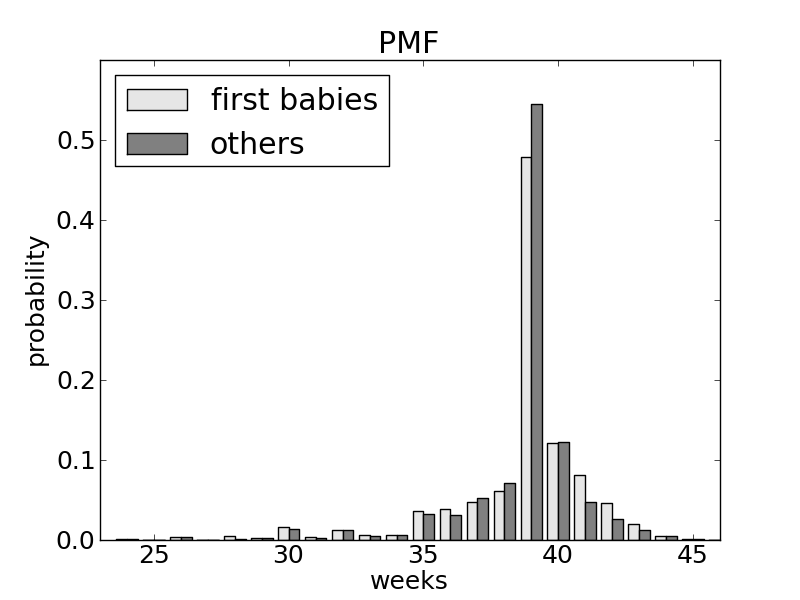 The distributions are similar for first babies and others. 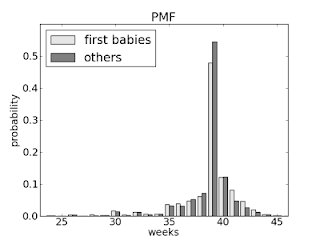 The mode is 39 weeks; the distribution is skewed to the left, with some births as early as 24 weeks, but almost none later than 44 weeks. 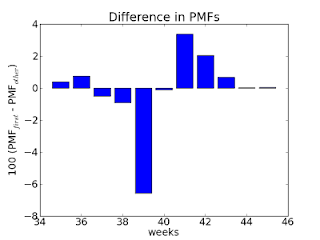 The general pattern is that first babies are more likely to be early (37 weeks or less), less likely to be on time (38-40), and more likely to be late (41 or more). In terms of relative risk, first babies are 8% more likely to be born early and 66% more likely to be late. 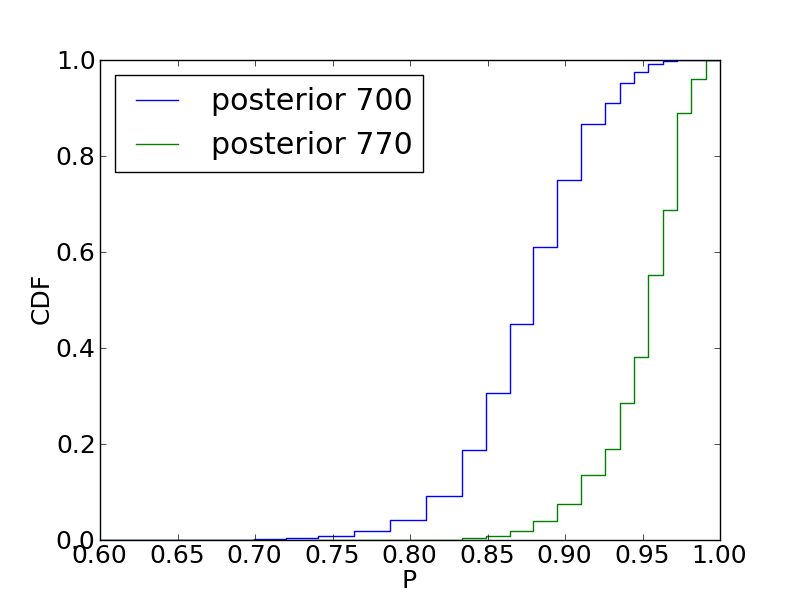 And those differences are statistically significant (using a chi-square test, p < 0.001). So far, none of this is useful for planning, so let’s consider a scenario: suppose you are in week 38 and you want to know your chances of delivering during the next three weeks. For first babies, the chance is 81%, for others it is 89%. So yes, in this scenario, first babies are more likely to be late. Sorry. UPDATE: November 2011. Are first babies more likely to be light? UPDATE: January 2013. Are first babies more likely to be late, revisited. Most colleges use the SAT as a criterion for admission because they assume that SAT scores contain information about students’ preparation. The College Board defends this assumption with evidence that SAT scores are correlated with first-year college grades. But even in their own studies, the correlation is only R=0.53. Correlations are often reported in terms of “explained variability”: a correlation of 0.53 explains R^2=28% of the variance in the data. But even that overstates the predictive power of SAT scores because it is expressed in terms of variance, not standard deviation. To make that more concrete, suppose you are trying to guess students’ first year grades; how much better could you guess if you knew their SAT scores? Without using SAT scores, the best you could do is to guess the mean, which is 2.97 in the College Board study. 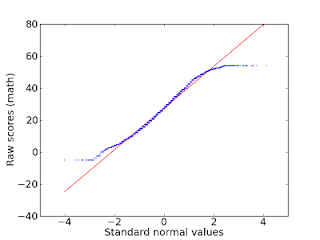 In that case your root-mean-squared-error (RMS) would be the standard deviation, 0.71. Using SAT scores, you could reduce RMS to 0.60, which is a 15% improvement. That’s a little bit better, but 0.6 is the difference between a B average and an A-, and you should expect to be off by at least that much 32% of the time. In fact the problem is even worse than Paulos suggests, because the SAT doesn’t discriminate very well between people at the top of the scale. For example, the difference between a 700 and a 770 can be as few as 4 questions, which might be due to chance. To quantify that, I will compute the chance that someone who gets a 700 is actually better than someone with an 770. By “better,” I only mean “better at answering SAT questions,” which I will describe with P, the probability of getting a question right. To estimate a student’s value of P, we start with a prior distribution and use the test score to perform an update. We can get a reasonable prior distribution by taking the distribution of scaled scores, mapping them back to raw scores, and converting raw scores to percentages. 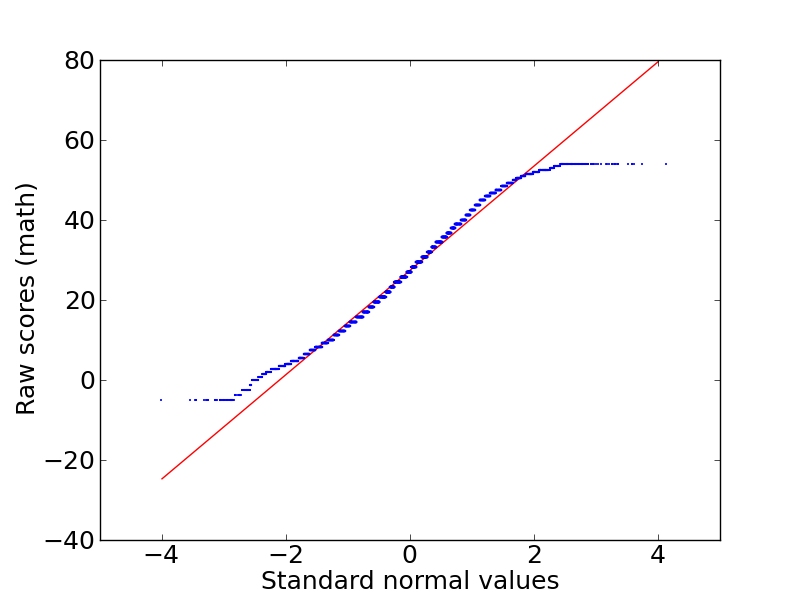 The red line shows a linear fit to the data. At both ends, the data deviate from the model, which indicates that the range of the test is not as wide as the range of ability; if it were, the top score would be 80, not 54. The 90% credible interval for a student who gets a 700 is (650, 730); for a student who gets a 770 it is (700, 780). To put that in perspective, at Harvard the interquartile range for the math exam is 700-790. So a student who gets a 770 might really be in the 25th percentile of his or her class. And the chance is about 10% that a classmate who got a 700 is actually better (at answering SAT questions, anyway). Notes: I made some simplifications, all of which tend to underestimate the margin of error for SAT scores. 1) Some SAT questions are easier than others, so the probability of getting each question is not the same. For students at the top of the range, the probability of getting the easy questions is close to 1, so the observed differences are effectively based on a small number of more difficult questions. 2) The compression of scores at the high end also compresses the margins of error. 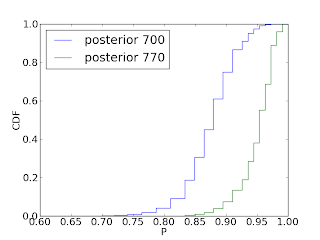 For example, the credible interval for a student who gets a 770 only goes up to 780. This is clearly an underestimate. 3) I ignored the fact that students who miss a question lose ¼ point. Since students at the top end of the range usually answer every question, a student who missed 4 questions loses 5 points, amplifying the effect of random errors.